Dr Mark Harmon is strategic director for Salix client eConsult. His story, published in the Guardian Healthcare Network, is a remarkable one. “People often wonder what life would be like if they could start over: what path they would take, what career they would choose. Ten years ago I did just that. I’d worked in the commercial sector all my working life, building brands for household names such as Speedo and Nike. But it wasn’t until my newborn son became very ill that I had the courage to change trajectory. Taking perhaps the biggest risk of my life, I quit my job and decided to pursue an ambition I’d held since school: a career in medicine. I’m now a newly qualified doctor working in A&E in London. I’m also in my 40s. “Our son became severely ill soon after birth. Admitted to St George’s hospital and requiring specialist input from multiple clinical teams, it became clear within the first few days of his life that he would face complex and lifelong challenges. I can’t even begin to describe the sheer physical stress and emotional turmoil of those first few weeks. The only constant was the kindness and compassion shown by the incredible team of clinicians looking after our son. “Interacting with those professionals day in, day out reignited a passion in me that had long been buried. So when I stumbled across the hospital’s medical school, I went in and found out the upper age limit for applying. To my surprise, there wasn’t one. “In that moment, standing in the dark back corridors of St George’s hospital, I decided to become a doctor. Not only for my son, in honour of the amazing care he had received in his short but difficult introduction into the world, but also for myself, and the lessons I’d learned from years of working with top athletes – to keep pushing, and to never have any regrets. “Was I prepared for life in the NHS? Absolutely not. Never have I worked so hard for so little financial reward and, for most of the time, with so little support. Like many first-year doctors, I found myself flying solo just weeks after graduation, working three weekends in four, holding the bleep on call, suddenly responsible for hundreds of patients, many of whom were very sick. “I found the leap from medical student to doctor a tough one, and I continually admire the way my younger colleagues, many still in their early 20s, cope with the pressure. Entering medicine as a mature student has brought its own set of challenges, but has also helped me navigate some of the trickier aspects of the job. 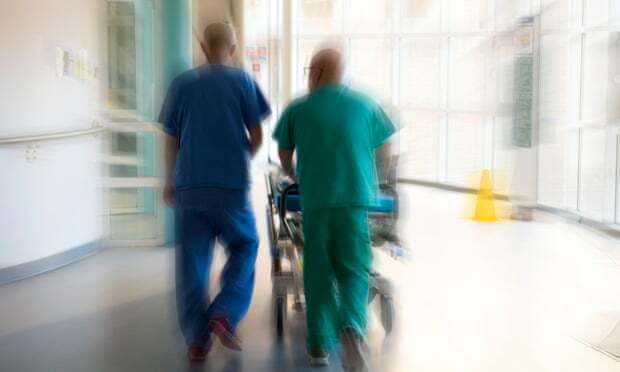 From having difficult conversations with patients to making critical decisions on no sleep, life experience has given me some resilience to the stresses and strains of life on the ward. “Working in the NHS the past four years has made me realise just how complex delivering world-class care can be, but also the myriad opportunities to make it better. This is where I hope to make my mark: to use skills and insight from my former career to improve current ways of working. In the retail sector we were constantly striving to enhance our customers’ experience. Why shouldn’t the same principle apply to the NHS? Alongside my clinical work I’ve chosen to explore how digital technologies can create a more patient-centred system, improving access to NHS services and streamlining the patient journey. It’s why I think it’s so important to embrace diversity in medical schools, and to encourage those – like myself – who may be older, or from a non-scientific background, to apply. If we don’t, we risk stamping out the creativity and innovation that could be key to its survival.